Vian's vocabulary isn't quite as good as his brother's. So what's documented below is my own interpretation of his actions and expressions. It's bedtime and I'm rocking Vian to sleep. He fell asleep on my arms and I've been rocking him for nearly an hour. I decided it was time to put him down. As soon as I put him down, he wakes up in shock and disbelief. Vian: I can't believe you've done this. His lower lip starts to quiver. Vian: You better pick me up you overgrown human or I won't hesitate to use these brand new vocal chords. He's back on my arms and starts to grunt a few times. Vian: Let that be a lesson, don't let me catch you in one of your shenanigans. Promptly fell back asleep in my arms. Vian and I started taking walks around the block in the evening. I carry him around all swaddled and he coos and babbles for a few minutes. I sing his favorite Tamil lullaby and he slowly calms down and rests his head on my chest and drifts into sleep. The awesome thing about our neighborhood is everyone I meet during the walk is genuinely happy to see us. I usually get a thumbs up from cars driving by or neighbors want to stop and take a closer look at Vian. Some of them offer up great advice about how they raised their kids. If he's ever fussy during our walk I add a bounce to my walk. At times like that, I get a sympathetic nod from fellow walkers and one woman said "It'll get better, don't worry" as she was passing by. Night time is a whole another story. Yoshi wakes up a few times to feed him. Sometimes she'll hand him off after the feeding to change him or rock him. Those are my favorite times. He's wide awake and giggly. He's smiling the entire time I'm changing his diaper. Even after I swaddle him back he's usually all smiles. I rock him on a yoga ball and within 15 mins he's passed out again. I hold him for another 5 or 10 mins and then put him back on the bed. The best part is his sleepy grin after I put him down. His eyes are closed and he's asleep, but he still manages to crack a dreamy smile. So I always take an extra few minutes to take in his smile before returning to sleep myself. Even though not every night is as smooth and easy as I described above, I'm quite content with my life. When Sempi was a little baby we had a hard time putting him to sleep. I would rock him for hours (yup, hours) trying to get him to sleep. During those days I would sing a Tamil song that my mom taught me in the hopes that it'll calm him down and put him to sleep. Never worked. With Vian we are going through a similar experience (you'd think we'd learn by now) of rocking him to sleep. But this time when I sing that Tamil song he actually calms down. He stops crying, places his head on my chest while I rock him and sometimes even falls asleep. This of course brings me tremendous joy. I was patting myself on the back congratulating for perfecting my singing technique. Only to find out later that he also calms down (faster) if the vacuum cleaner is in use. Yoshi found this out accidentally while vacuuming the house while wearing him in a wrap. He was passed out in under 5 minutes flat. 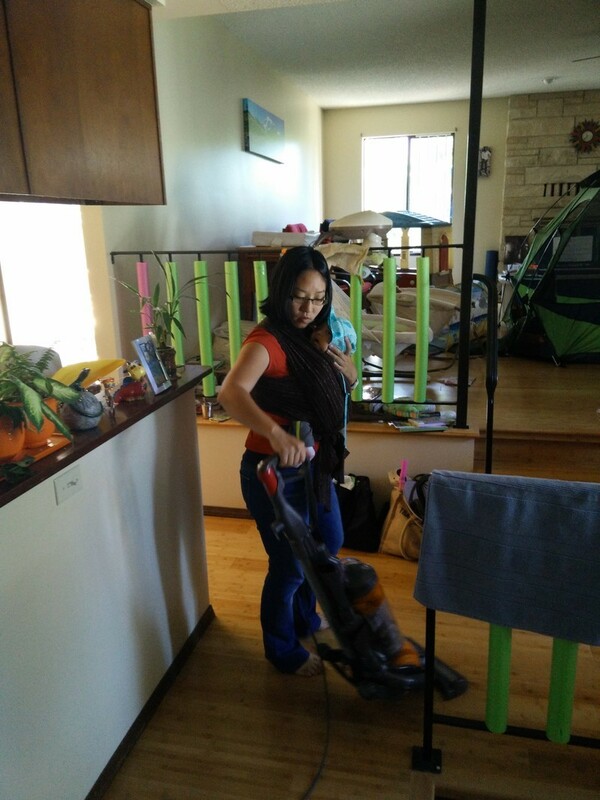 My son likens my singing to the sound of a vacuum cleaner. I'm beaming with pride. Sempi and I are at our favorite neighborhood coffee shop, reading books and eating bagels. Me: What would you say if someone offered a nickel for Jelly Bean (nickname for his brother Vian). Me: Haha. So you'll give them Jelly bean for a nickel. I guess he didn't really understand the poem or my question. But I was amused that his first response was "Thank you". After a particularly rough night with the new born, Yoshi and I are sitting in the dining room eating breakfast. Vian is sleeping in the bedroom. Yoshi: Can you check on the baby? Me: He's sleeping with the utmost satisfaction of someone who has stolen two people's sleep.